That’s how Tom Width, artistic director of Swift Creek Mill Theatre, intro’d Those Harvey Girls last Saturday night…and boy, was he right! 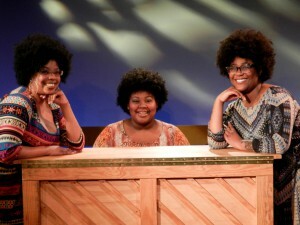 The show is no less than a joyful religious experience, featuring three gifted actor-singers who play themselves: the Harvey sisters who rose to prominence as one of Virginia’s most well-known Gospel-singing groups in the 1970s. 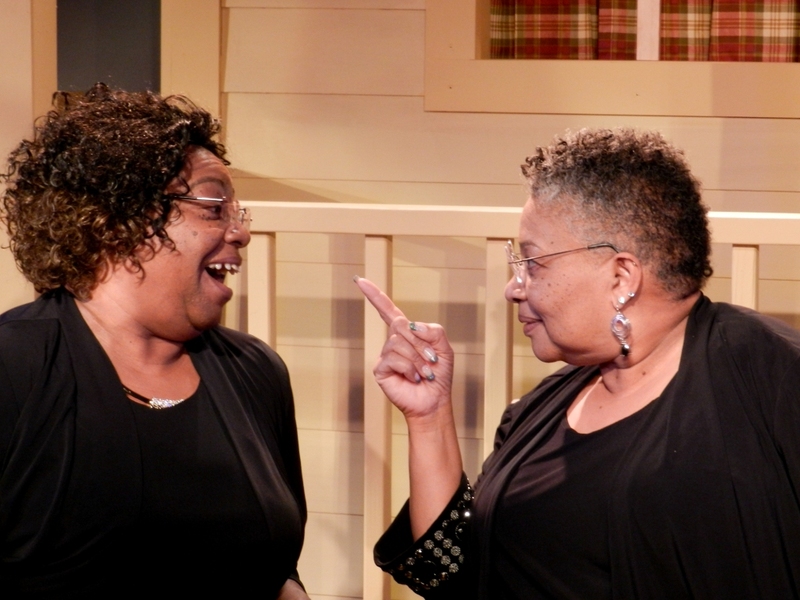 Today, these soulful African-American women can still raise the roof—this time the roof of the historic playhouse—as they belt out powerful Gospel music and age-old hymns, one rhythmic song after another. Throughout the no-intermission performance, the audience can’t help but join in with toe-tapping, hand-clapping praise. The autobiographic musical starts midst grim circumstances – immediately following the funeral of the sisters’ mother. Dressed in black and sitting near the front porch of their childhood home, the three adults pause to reflect, bantering back and forth about their parents, their childhood, and their sisterhood. The tone quickly morphs from sadness to humor as they reminisce. No angels themselves, the Harvey family stories are rich, and the sibling rivalry is good-natured. Through faith-filled songs, poignant stories, and moving cameos of their youth, they share their ups and downs as Cora, Callue, and Bee Bee – the young children of Deacon Ruffin and Deaconess Eva Elizabeth Harvey of Newtown, Virginia. Their harmonic symmetry is not only perfect, it reflects their interdependence: though each is unique, they are one through heritage, faith, and music. They’re also amazingly transparent, telling it all — from childhood antics and teen talent shows to collegiate crisis and motherhood. The sisters give voice to the importance of family and faith, which sustained them through all. They praise their parents for loving discipline and Christian mentoring. And always their memoirs are laced with humor: the kind that bellows up as side-splitting laughter among themselves, and likewise audience members. 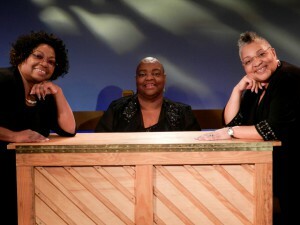 The show features Gospel music legend Cora Harvey Armstrong with her sisters Clara Lue Harvey Jackson (the Callue origin story) and Virginia Elizabeth Harvey Young (known as Bee Bee). They are supported by a cast of six super-talented youth who act as their younger selves in childhood and teenage vignettes. As for the music itself—which never disappoints!—Cora sings several songs that she composed, such as “Safe In the Arms of Jesus.” She and her sisters also entertain with well-known hits from the past, including “Midnight Train to Georgia” and “Stop! In the Name of Love,” which idols Gladys Knight and Diana Ross made famous. The Bible, which sits on the front-porch banister throughout the show, doesn’t take prominence until near finale, when Bee Bee reads with fervor, “Be ye of good courage … and wait on the Lord.” Obviously, these words of wisdom guided the sisters yesterday and continue to do so today. Amen, Sisters! Those Harvey Girls, part of the Acts of Faith Festival, runs Thursday through Saturday evenings at 8 p.m. through March 7, with matinees on February 11, 14, 22, and March 7 at 2:30 p.m. at Swift Creek Mill Theatre. Tickets are $38 for theatre only; $55 for theatre and buffet. Senior, military, student, and group rates are available. Parents and Christian schools may prefer the Youth Performances, which are age appropriate for grades four through twelve. These ninety-minute matinees are scheduled for February 19 and March 6. The sisters’ antics educate as they entertain, meeting numerous SOL requirements. 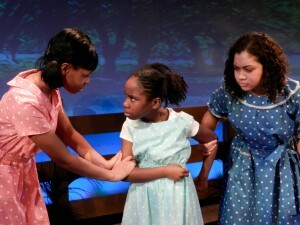 The Youth Performance is priced $12.50 for theatre only; add $2.00 for pizza lunch. Reservations at (804) 748.5203. Click here for tickets: Those Harvey Girls. Trust me, if you trust the Lord, Those Harvey Girls is worth the drive!